Fiber Fusion Northwest is a 2-day event focusing on natural fibers and fiber arts. Our goal is to support fiber artists, local breeders, and fiber related businesses by increasing public awareness of natural fibers and their many creative uses. Amy Wolf is from Monroe, Washington where she has been raising registered, nationally awarded white and natural colored Romney sheep and Angora goats with the Pines Farm. Amy has been a professional sheep shearer for over 25 years, shearing more than 30 different breeds. Together with the Pines Farm, she processes over 2000 pounds of wool and mohair for resale to hand-spinners, felters, and weavers. 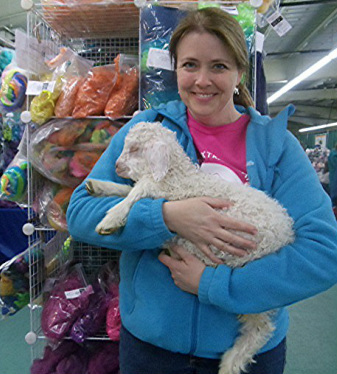 Amy travels around the western United States teaching classes and judging sheep and fiber goats. Fiber Fusion is 2 full days of fiber, education and fun! Whether you are new to the world of natural fibers or are an experienced fiber arts aficionado - Fiber Fusion has something for you! We will be offering a wide variety of free fiber arts demonstrations as well as over 30 great classes focusing on all things fiber - from fiber preparation and spinning to dyeing, knitting, crocheting, weaving, and felting. There will be fabulous fleeces to view and buy - alpaca, wool, mohair, llama and angora - at our fleece shows and sales, as well as over 60 vendors featuring fabulous yarns, rovings, books, supplies, tools and more; a live fiber animal exhibit, a fiber arts contest, people’s choice photo contest, a spin-in and much more!